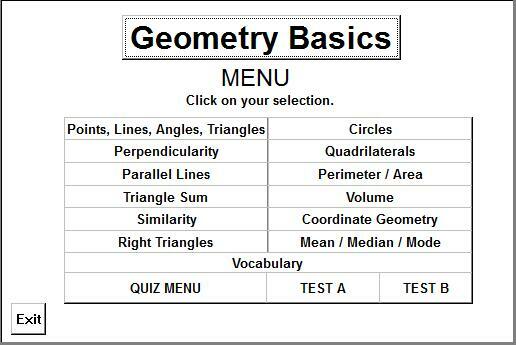 This basic geometry software program covers all the major high school topics in a survey approach. 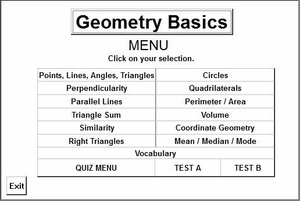 Basic geometry topics taught and practiced are: Points, Lines, Angles, Triangles, Perpendicularity, Parallel Lines, Triangle Sum, Similarity, Right Triangle Geometry, Circles, Property of Quadrilaterals, Area, Perimeter, and Volume. This interactive geometry software program also contains an in-depth "Vocabulary" section and a "Coordinate Geometry" section (with Transformations, Midpoint and Distance) Geometry help is always available in the form of hints and step-by-step solutions which unfold upon student request. QUIZZES and TESTS: A Quiz is provided for each learning section. The program contains two comprehensive Tests. Use Test A as a pre-test and Test B as a post-test. Or, simply start the learning with the first section and test the students later. The tests are scored and stored automatically by the computer. A printout of the student's answers and EVALUATES which sections require additional learning is provided. This basic geometry material is presented to classroom students over the course of years - some concepts beginning as early as elementary school and continuing through high school. Use this tutorial geometry software to keep up with schoolwork with the geometry help it provides, to learn at home, to remediate, to accelerate, as a course or as a reference. Vocabulary menu helps you find definitions quickly! Or take the HINT to get started! Variety of Questions makes learning interesting.